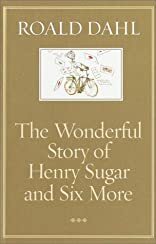 This collection of stories includes "The Boy Who Talked With Animals", "The Hitch-hiker", "The Mildenhall Treasure", "The Swan", "The Wonderful Story of Henry Sugar", "Lucky Break" and "A Piece of Cake". 2/18/2008 Patricia Storms said: Love Roald Dahl. Love Quentin Blake. I'm not big on sucky stories for kids – I like my stories to be dark and quirky.